Lighting the way to a brighter future! At The Lighthouse School, Handwork has been determined to be an integral piece of a child's development. Because of this, opportunities to participate have been included in the curriculum at all grade levels. Through beauty, color and form, the activity of the fingers helps strengthen our connection to the brain. Handwork reinforces those fine-motor skills which in turn stir brain development through the opening of unused neurological pathways. Hands become skillful, sensitive and strong, so as to accomplish many wonderful deeds. A basic understanding of handwork skills begins in kindergarten, where students explore raw wool fibers and see how they are spun into yarn. First grade continues the process, as students actually learn to knit. Second and third graders make their own knitting needles and hone those skills acquired in first grade. 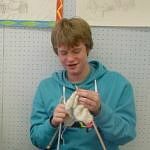 Fourth graders practice advanced knitting techniques, while fifth graders learn to crochet and create a variety of wool crafts. Our middle school age students are offered Handwork as an elective. Throughout the full year course, they may tackle hand-sewing, cross-stitch, macrame, knitting or crocheting, basket making and a variety of other craft projects. At times, donations of these projects are delivered to needy causes, such as baby hats for newborns in need or slippers for adults in nursing homes. It is our desire to see the older child make the connection between their simple efforts and the impact they can make in the lives of others. Many things happen simultaneously in the handwork classes. First there is the opportunity to learn practical skills; how to use and care for the tools and materials provided; how to work with color and pattern; and how to channel one's energy to complete a project with satisfaction. Following directions, honing fine-motor abilities and tracking skills are also examples of areas developed through handwork. We recognize handwork can be therapeutic and carries with it skills that can last a lifetime. Beyond all of this, we want the children to make things they love and enjoy; to work skillfully, always increasing their artistry. Handwork should be relaxing and fun, and at the same time foster inner growth and a sense of well-being. These lessons support and complement other subjects throughout our curriculum, helping to bring balance and wholeness to our children's education.